Here is another in series of articles providing pointers for project planners on how to ensure right ingredients are put into a project to increase the chances of its success. Among a list of factors that contribute to a successful project, first and foremost come the people who would actually execute or implement the project. Team acquisition is the process of getting the human resources needed assigned to and working on the project. Without a knowledgeable team, the project will be much more difficult. Some things to consider when picking your team are previous experience, personal interests, personal characteristics, availability, and competencies and proficiency. The resources for finding team members can be endless. 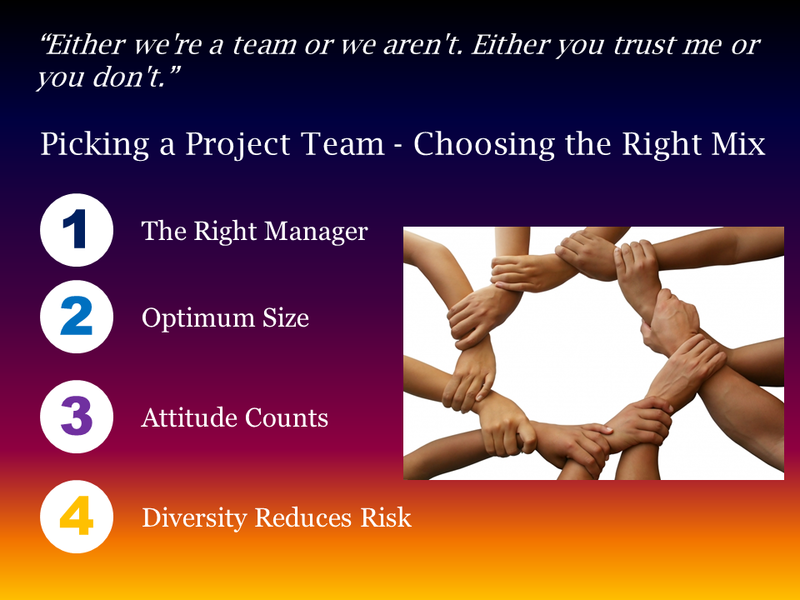 Choosing a right team with a right manager can help ensure that many problems that the project could face are avoided at the team level itself. Measure how bold the selected project manager candidates are willing to be throughout the interview process HOW TO DO THIS? Prepare some case situations where the candidates have to take decisions in impossible situations for instance giving a bribe or closing a project, taking orders from boss or opposing in case of conflict etc. Formulate case situations where one of the options for deciding is pro company policy and other is anti-policy. Analyze their answers to understand things they strongly feel about. Take feedback from the employees that have worked in team with and under the candidate AND DO WHAT? Try to understand from the feedback if the candidate could keep the team together during conflicts. If the candidate has had many conflicts or is univocally considered dominating by all his previous team members, then the person is not suitable to be a team leader. Once a team leader/manager is selected, it is time to pick the right mix of people to form the team. Along with a right project leader, the success of a project also depends on picking a team that is competent for the project. The team members may come from negotiations with managers and other project teams, pre-assignment from another project, or even from outside the organization. You will also need to determine whether each team member will be working on the project full or part time. Thinking ahead of the ideal team members can save valuable time. Hence it becomes one of a very critical decision in the lifecycle of a project. This is one time when the leadership should work very closely with the project lead/manager and choose the personnel based on merit to suit the requirements of the project. Some guidelines that organizations could incorporate in team selections process are given below. Subject prospective team members to situational tests and see if they choose options which are aligned to company policies. Try to go over the career history of employees and their performance records to understand their attitude towards work. In case the candidate is known to have or create problems for others in previous teams, he or she should not be picked for the team. While I talk about the skillset at end, it is only because of an assumption that project managers and leadership would already have this in mind. While existing capabilities of team members is a critical criteria, this is to be supplemented by adequate training. Once the team is selected, it helps it to expose it to some team building and skill development exercises. Organize a group outing for the team in an informal setting. Use services of professional team building agencies for very important projects. Organize occasional group dinners etc. to keep the chemistry fresh.